O.k., Petalena didn’t actually go to Hollywood, but since Hollywood is coming to Boston constantly to shoot movies in our fair city, we’ve been doing some work in film too! 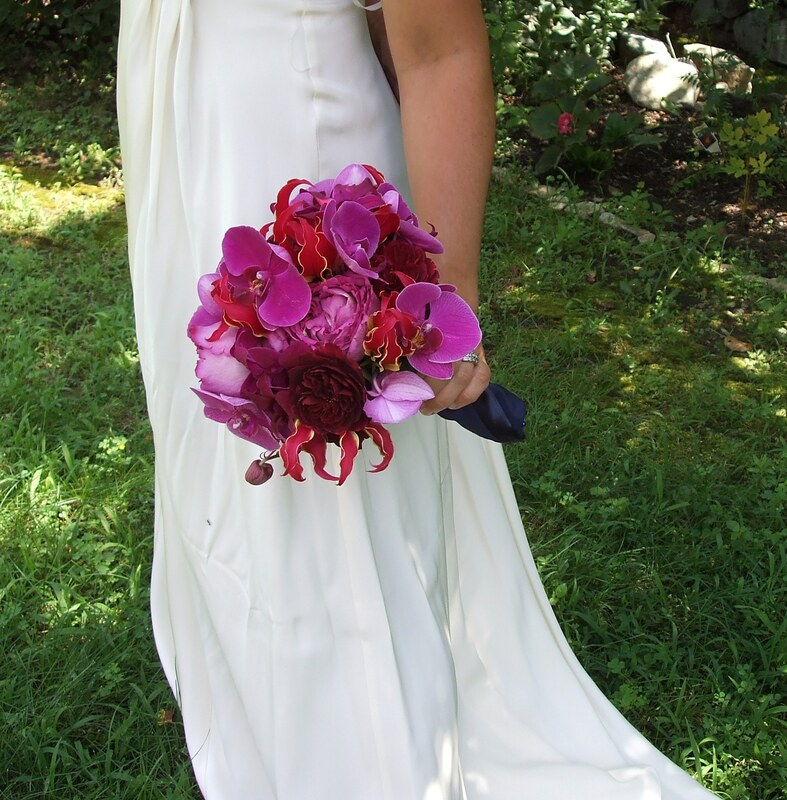 Below is a photo of a bouquet and boutonnière we did last week for a movie shooting in Boston. I wish we could say which movie it is, but since it is still in the filming stage, we just can’t say, it’s super duper TOP SECRET! 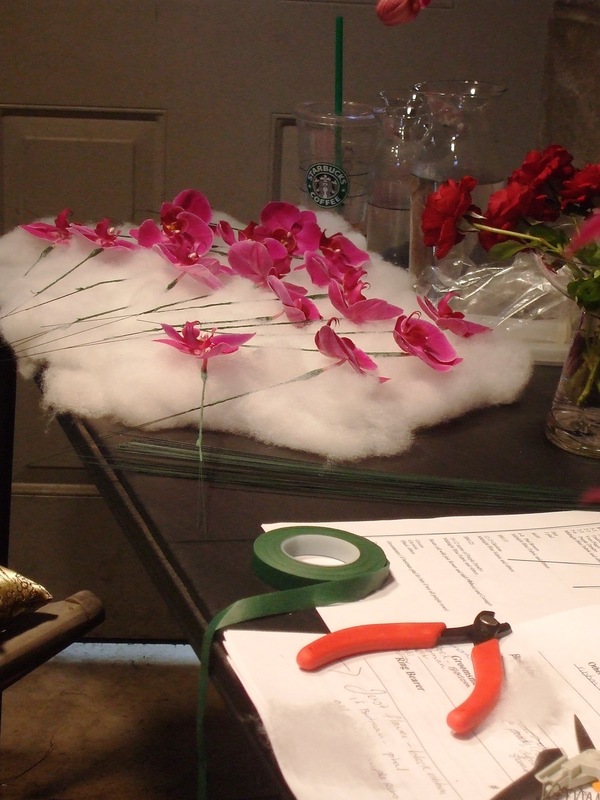 But let me just say, we’ll be so psyched to see our floral designs on the big screen!! Using apricot and burgundy together is really a gorgeous color combination. Apricot is one of those great colors, not quite pink, not quite orange, softly beautiful and looks lovely with most skin tones to boot! Incorporating a deeper burgundy in the mix keeps the design from feeling too precious, giving it a little punch and accent. Looking at other designers, you can see how the talented folks at Martha Stewart use it; and how the amazing Ariella Chezar does as well. Visit our website to see more of our design work. 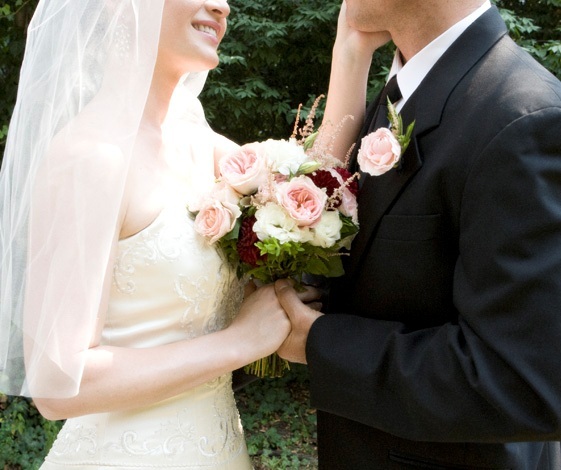 Beautiful photo by our friend and supremely talented photographer, Claire Folger. Just before Apryl and I delivered the photos for the wedding today at the Langham Hotel we modeled a few of the bouquets. We always do this for documentation purposes (photos are so great to help remember what works, what is in season, etc) plus now that we have the blog, we can post them here too! All photos by Petalena. For more of our design work, visit our website too! Just about to dash off to the studio to finish up the final details for our wedding this weekend and wanted to post a few photos I took yesterday as we were working away on the bouquets and arrangements. 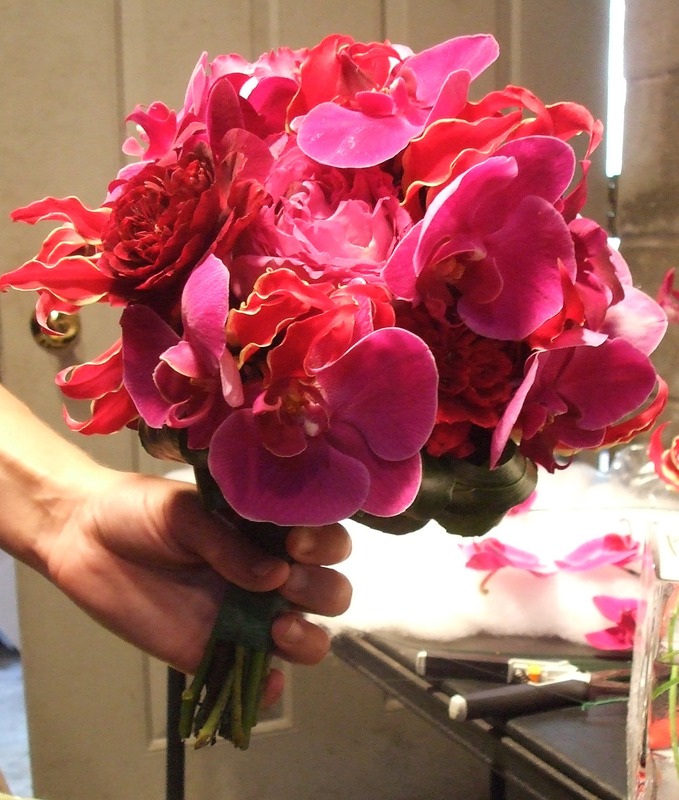 Here is a shot of Apryl beginning our bride’s bouquet, incorporating the phalenopsis orchids, gloriosa, and Yves Piaget garden roses. 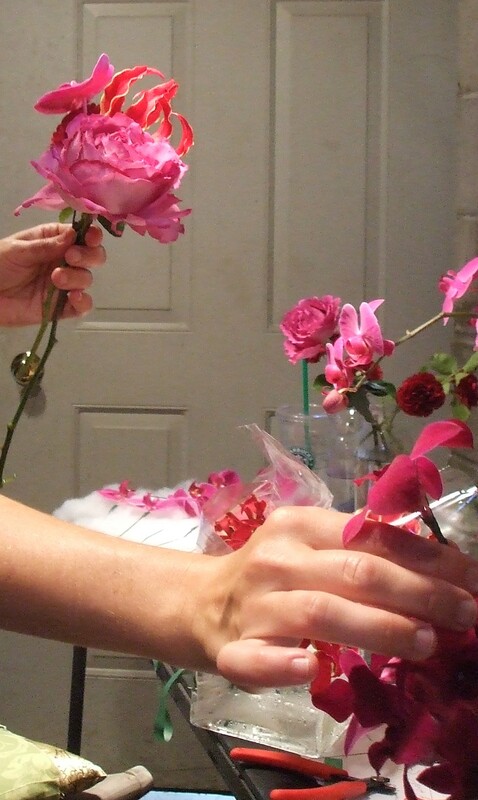 Apryl is just amazing, she really becomes almost meditative when she does a bouquet, quiet and deeply concentrating. 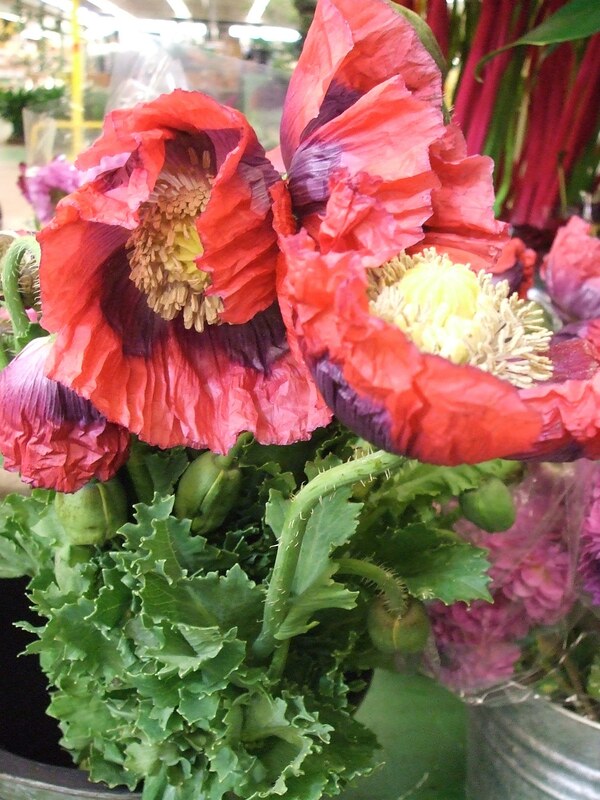 We were at the flower market again this morning picking up flowers for our bride’s wedding this weekend at the Langham Hotel and I snapped this quick picture of a really gorgeous bi-colored poppy in pink and purple. Aren’t they incredible? They look so tangled and alive, almost remind me of muppet character! We’ll post some pictures from our studio tomorrow as we work with a gorgeous color palette of magenta, purple, and deep red for this weekend’s wedding. 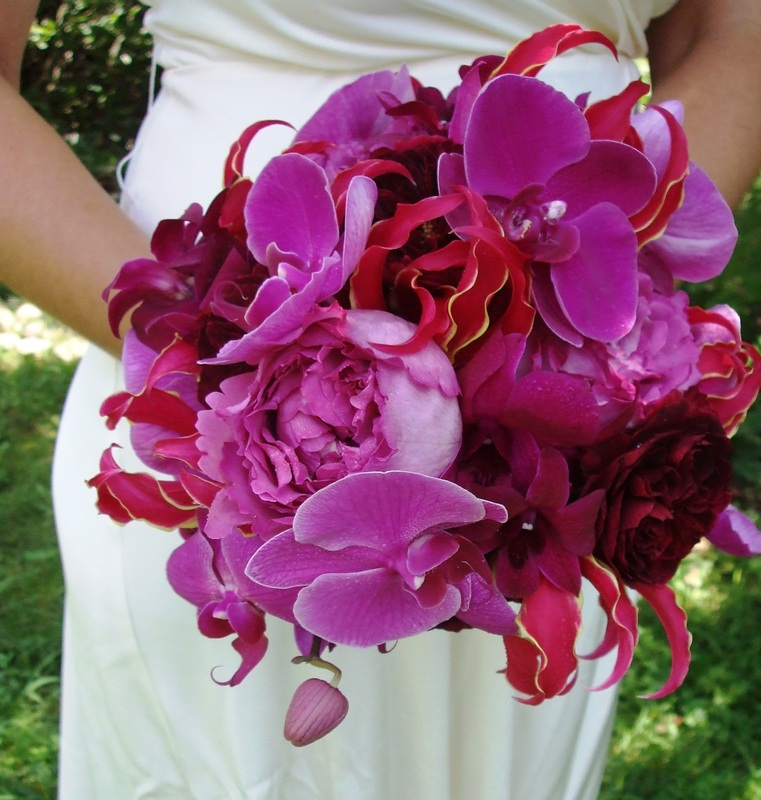 Some really great flowers are in the mix for this wedding, purple dendrobium orchids, gorgeous garden roses, magenta gloriosa, and deep pink phalenopsis orchids. 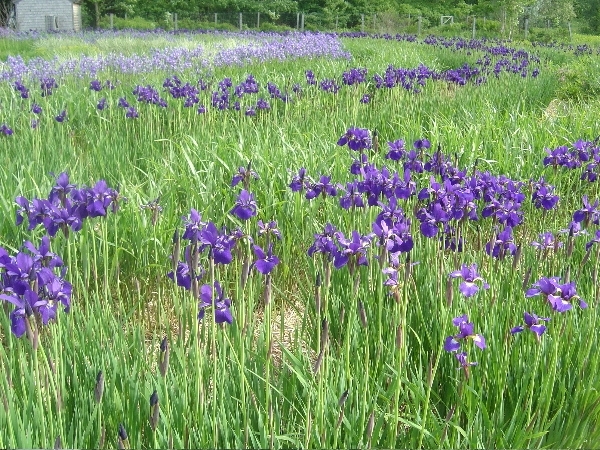 Although iris season in Massachusetts has come and gone by a few weeks now, I wanted post two pictures of local iris that are utterly inspiring. Visiting with a friend in Newburyport, Apryl and I had the chance to visit an incredible garden. 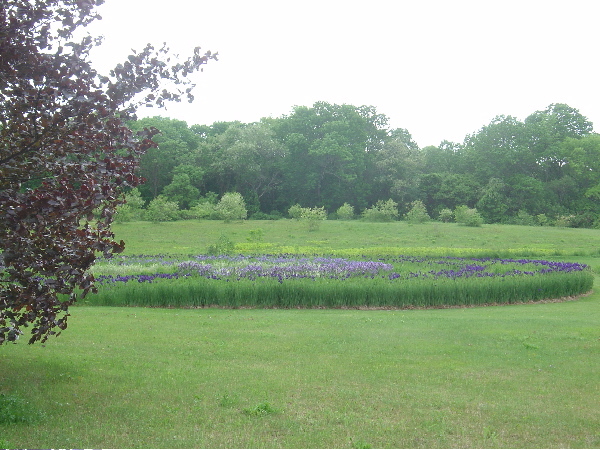 Here, a self-taught garden designer used Siberian iris to create an actual maze. It was just incredible. Even earlier in the season before the iris were blooming, the maze was beautiful, just tonal variations in the grass, subtle and surprising. Seeing a plant designed with in this way just opens your mind to all kinds of possibilities. The iris really becomes something else, something beyond itself, this is what I find exciting about design and why I love what I do! More and more we’re all looking for unique shapes and textures in the flowers that we bring into our home, for weddings, and almost any kind of event. An early trip to the Boston Flower Market this morning revealed how more locally available and seasonal vegetables are making their way to the marketplace for us lucky designers to get to use! Take garlic scapes for example, did anyone even know what a garlic scape was before a few years ago? Now as the early spring and summer vegetables emerge, garlic scapes are in the mix. Not only are they tasty chopped finely and added into a nice omelette or risotto, they are great in floral designs! 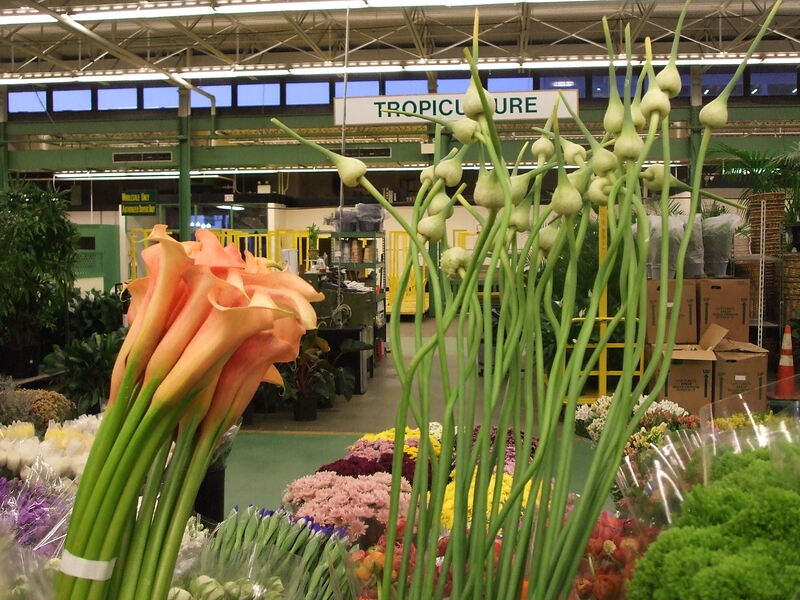 Even here, simply placed into holding buckets at the flower market, the scapes look incredible alongside calla lilies. 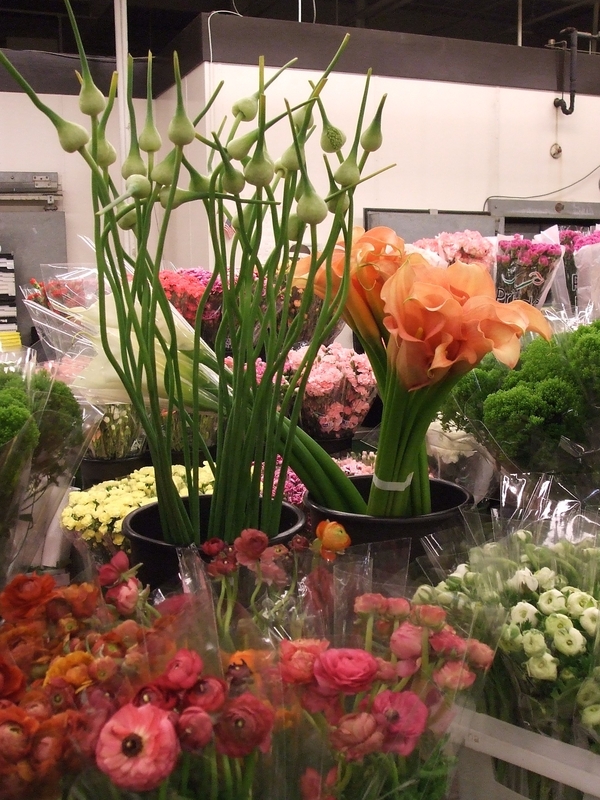 The creamy white-green of the scapes against the saturated light peach color of the callas is simple and gorgeous! And, best of all, garlic scapes don’t really smell like garlic so they would be a great addition to a bridal bouquet or table arrangements, even a boutonnière! These are such unique looking plants; pale green stems with thin, elegant tendrils at the top. So sculptural and unique and elegant. Like all plants in the allium family, garlic grows underground. As the garlic bulb grows harder, a little green shoot pokes up through the soil, growing long and thin. This is the scape. Farmers cut the scape from the garlic so the bulb will continue to grow and we are the lucky recipients of this culinary and floral design treasure. I can’t wait to use these in future designs! I wanted to post a few more documentation pictures from the ‘Aquarium’ wedding this past weekend – just a few quick photos Apryl and I took of the bouquets before we delivered to our bride. 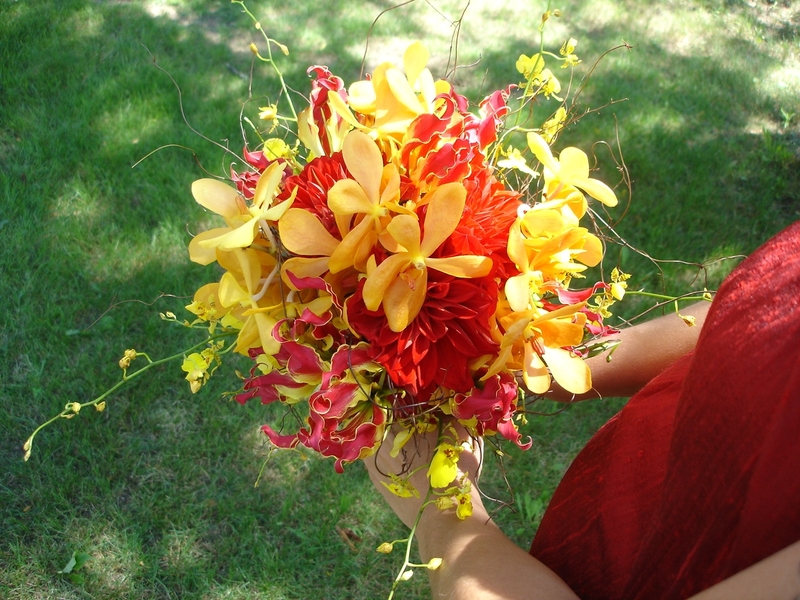 These photographs show how a bride can use bright reds, oranges, and golds (colors that most of us associate with fall) in way that is still summery seasonal. 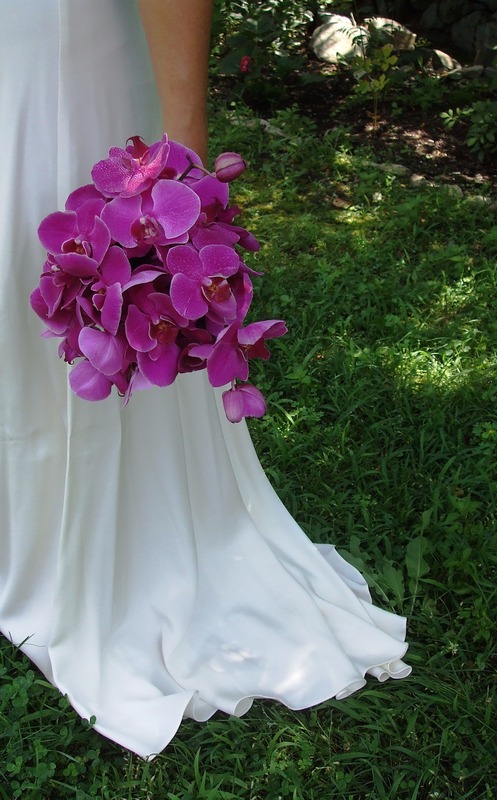 Lots of brides gravitate to the deep pinks or blue/purple palettes for summer weddings for good reason, lots of incredible flowers are available in these hues during the summer months. But red can definitely work too! The trick with this kind of palette is to go a little bit tropical. 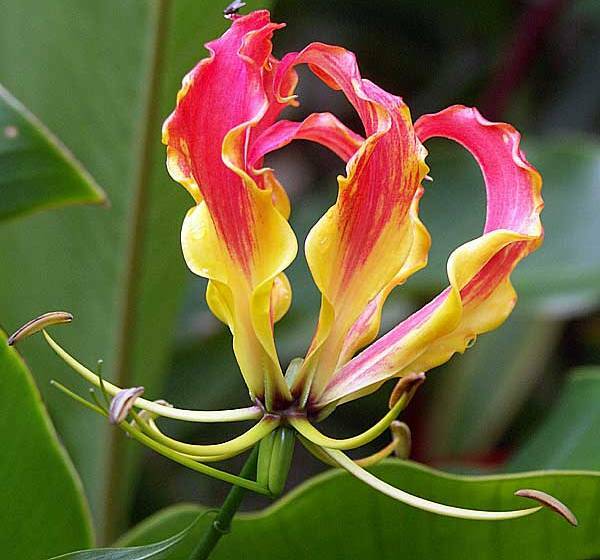 But what we mean by tropical is not cheesy plastic flower leis or Hawaiian shirts, really it’s just using more sculptural flowers that are traditionally grown in warm humid areas of the world! 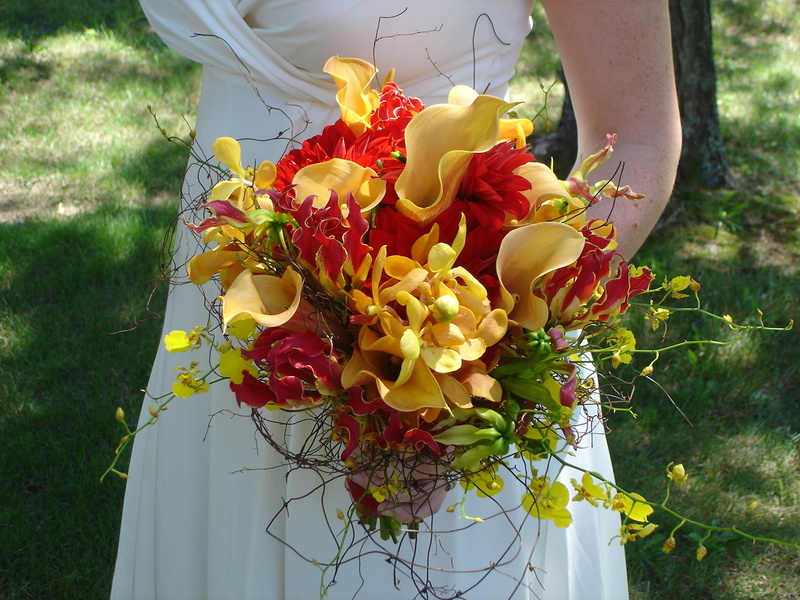 For the bouquets in this wedding we used gloriosa (pictured at left), a very cool sculptural flower, and orchids to keep the design more towards summer and less towards thoughts of fall leaves and pumpkins. Gloriosa is one of those flowers that I could just stare at for hours, it is so intricate and bizarrely wonderful, what can I say? I’m in love with this flower. Note, this also makes a really cool and funky boutionnere. 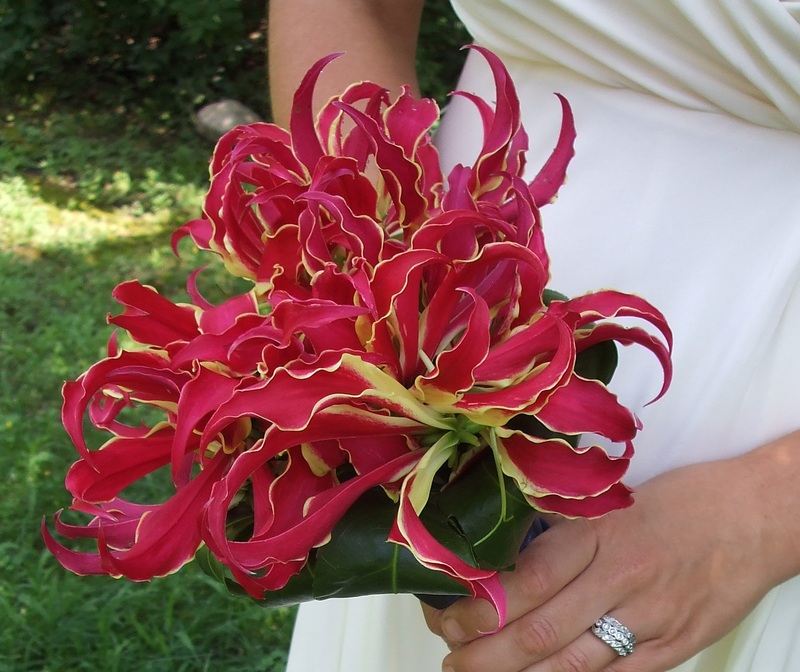 The MOH bouquet is a scaled-back version of the brides with fewer flowers but in the same design and palette. 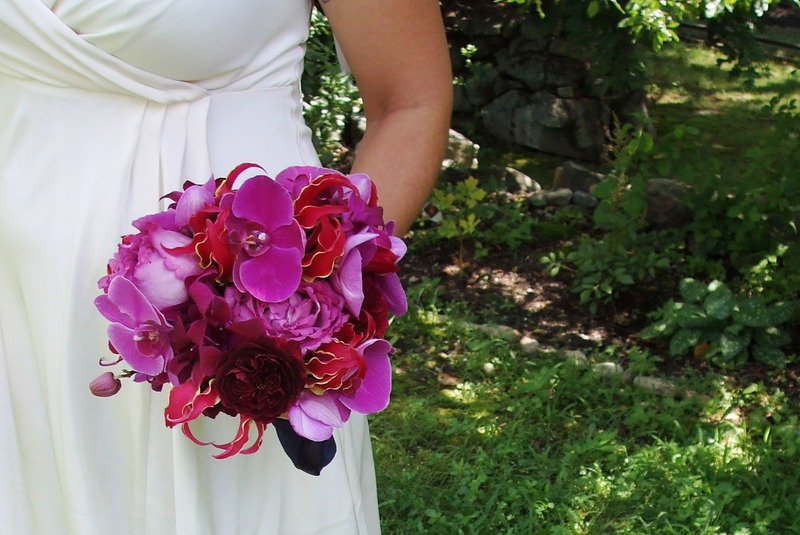 I like how red silk shantung of the dress picks up the colors in the bouquet but without being ‘matchy-matchy’ (which in my opinion, is the worst design sin! ).